Entrance of High Chaparral in Sweden. The Wild West theme park has been used to house Syrian refugees. I knew that Italians were fascinated by cowboys in the Wild West. I knew they made “spaghetti westerns.” But it turns out that legends of the American frontier have intrigued people in many other countries as well. In fact, in Sweden, Big Bengt was so fascinated that he built a Wild West theme park, calling it High Chaparral. It employees Syrian refugees, among others. Reports On the Media (OTM) at WNYC radio, “In the middle of nowhere southern Sweden, there’s a popular Wild West theme park called High Chaparral, where Scandinavian tourists relive the action of the old American cowboy films. For over a year, the park served another function: a refugee camp for some 500 of the 163,000 migrants – many from Syria – who applied for asylum in Sweden in 2015. “Special thanks to David Smith, author of the forthcoming book Cowboy Politics: Frontier Myth and the Twentieth Century Presidency from University of Oklahoma Press. For more about High Chaparral, check out two fantastic documentaries about the park from David Freid and MEL Films”: here and here. You can listen to the WNYC radio feature here. 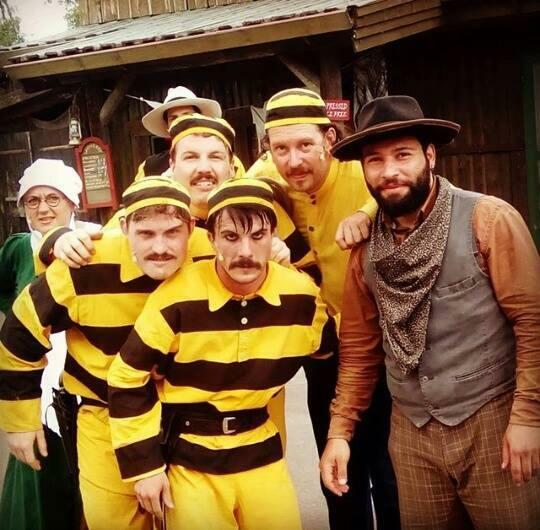 Abood Alghzzawi, dressed as a cowboy, poses with other High Chaparral employees in southern Sweden.